Congratulations on surviving medical school! Now you can proudly display that "MD" behind your name. And you should, it is an amazing achievement which required years of dedication and hard work. Unfortunately, there is still a ways to go before you get to the light at the end of the tunnel. Residency represents the "lean years" in your lifetime income. 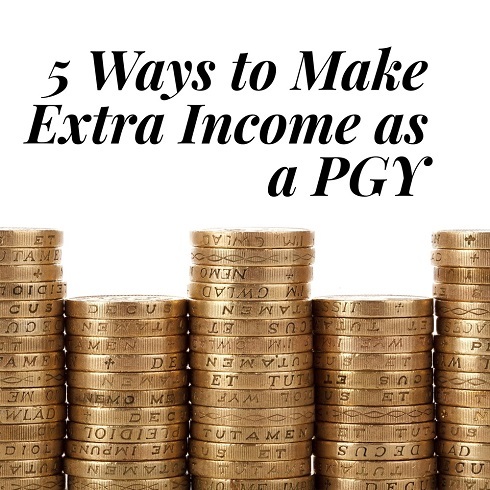 As you get ready for your first day as a resident, let's talk about five ways to make some extra income during your PGY years. 1. Moonlighting. By far the most lucrative and rewarding way of generating extra income in residency, especially if you can find work in your chosen specialty. For example, in my chosen field of radiology, the typical moonlighting jobs are divided between contrast coverage and/or providing image interpretation after hours and on weekends. Not only do you earn extra income, you also gain valuable work experience in your field of practice. Highly recommended. 2. Tutoring is another great way to make some extra cash. I taught the Kaplan MCAT class when I was in medical school and the starting pay back in 2009 was $20 per hour. I imagine it probably has gone up since then. It is a great way to stay connected to the basic sciences. And if you happen to tutor premed or medical students, there is an opportunity for you to become a mentor and play a major role in guiding a future colleague on their career path. Of course tutoring rates will vary, but my fellow money blogger Dr. Wise Money was able to charge $388 per hour! • It takes money to invest and that's the one thing we are likely to be short of. • The turn-around time of investing is a lot longer than moonlighting or tutoring. 4. Publish. Believe it or not, all those research papers can add up more than just lines on your CV. That's the great thing about becoming an expert in something. Sooner or later, people are going to try to pay you for that expertise. Don't believe me? Check out Dollars for Docs by ProPublica. 5. Participate in the sharing economy, also called the gig economy, the on-demand economy, the peer economy. You likely have heard of Uber, Lyft, AirBNB, and HomeAway. You can participate by sharing your car and your home with strangers in need of transportation and lodging. Personally I drove for Uber from June 2015 through January 2016. I had a lot of fun chatting with passengers and learning about their lives. But in the end, I decided there were better opportunities for my time. What are the drawbacks? • Low return for your time. In the Orlando market, Uber's reimbursement rate for Uber X drivers is $0.61/mile/minute. For comparison, the IRS allows you to deduct $0.54/mile on your tax returns! • Inherent risks of letting strangers into your car/home. See the story of Dr. Anjali Ramkissoon.